Award Winning - The Power Box was a 2011 CES Innovation Awards honoree in the category of portable power. 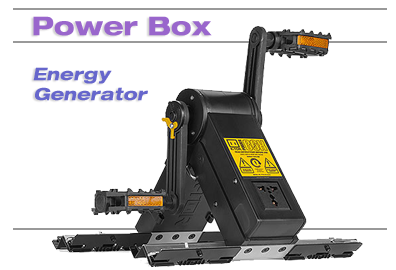 The Power Box is a pedal generator that can be used with your legs or arms. It generates electricity as you pedal, like on a stationary bicycle. Charge the batteries of a full range of portable electronics. Or, charge external batteries to power laptops and all kinds of appliances • either directly from the batteries or through an inverter. The Power Box has a universal outlet. It allows you to plug in chargers from anywhere in the world to charge your portable electronics. The Power Box is a great addition to emergency and survival kits. The Power Box can produce up to 20 watts. It can directly charge a full range of portable devices. Because it is so powerful, it can charge more than one device at a time • like a smart phone and a tablet. Since it can be cranked for long periods of time comfortably, it can be used for higher power applications that it cannot charge directly. Simply charge an external battery and run your appliances, either directly from the external battery or through an inverter. The Power Box folds, in seconds, to the size of a shoe box • 12 x 5.5 x 3.5 inches. It weighs just 4 pounds, 11 ounces making it very lightweight and portable. It is smaller and lighter than an exercise bike. It provides similar cardio benefits. And it generates electricity. The Power Box is designed to be very efficient. It converts the generator output to 120 Volts DC with 85% efficiency. 120 Volts DC is compatible with all switching chargers • the type used with all portable electronics, because they are also very efficient. Power Box Applications: From the business traveler to outdoor enthusiast, commuting student to emergency personnel, the Power Box is a great eco-friendly source for backup power. Fully functional anytime, anywhere, it lets you charge a wide variety of electronic devices, including, but not limited to, your cell phone, mp3 player, camera, GPS, or tablet. Any device with a switching charger of less than 20 watts will work directly with the Power Box. For devices beyond 20 watts, first charge a battery for that device, then charge the device with the battery. The Power Box is great for emergency power and should be on your checklist for basic emergency survival kit supplies. For disaster preparedness, it belongs in every bug out bag and 72 hour disaster kit. Survivalists and Disaster/Doomsday/Armageddon Preppers view our pedal generator as a great addition to their survival kits. Add the Power Box to your list of survival supplies. Feel confident that you can charge devices and generate power in emergency situations • from an earthquake to the apocalypse. Charge multiple devices at once • up to the maximum power of the Power Box • with a simple extension cord. See the Power Box Advanced Energy Generating Guide for more information. The Power Box can be used to charge small 12 volt batteries and keep essential electronics and small appliances running. It can also be used on-grid or off-grid as a back up to other sources of power. The Power Box has a keyed steel shaft. It can be powered by other devices like water, wind or any other power source, as long as it is not overloaded and doesn't exceed 1.5 cycles per second. The Power Box is foldable, compact, and lightweight. And it has a small footprint. It is portable and can be carried anywhere. The size of a shoe box and less than 5 pounds, it can power all of your essential emergency electronics and the Kindle or tablet you•re using to keep a log of your trip. The Power Box converts mechanical effort into electricity. So, it can be used as an arm or leg pedal exerciser that has a practical use as well. Think of it as a small stationary exercise bike with a dual purpose. It•s portable, compact, and folds to the size of a shoe box. You can use it at home, under the desk at the office, and while traveling. And, you can adjust the load to vary the resistance and fine tune your workout. Compatible with most portable electronics chargers like cell phones, tablets, digital cameras, etc. Product Warranty: K-TOR provides a one year warranty on all generators sold starting from the date of purchase. The one year warranty covers defects in material and workmanship only. If a unit is found to be defective, K-TOR will repair, replace or refund the unit. To request a warranty claim, contact K-TOR by emailing info@k-tor.com. Once a return has been authorized, the unit must be returned to the factory postage prepaid. Do not modify or overload K-TOR generators as this can damage the unit and will void the warranty. The Power Box pedal generator can support up to 20 watts. This means you can use a simple extension cord and charge multiple devices at once. Cell phones are typically 5 watts so you could charge three cell phones at once. A tablet is typically 10-12 watts so you could charge a tablet and a cell phone at the same time, etc. To charge devices more powerful than the power box can charge directly, you will need to charge an intermediate battery first • either an external battery or 12 volt battery. To charge a laptop, for example, you will need to acquire an external battery capable of working with your laptop. There are a wide range of these on the market. You will use the power box to charge the external battery and then plug the external battery into your laptop. Pick an external battery that can be charged via a switching charger. Many are charged via a USB cord and can be charged by a USB wall charger like those provided with cell phones. You can also use your power box to charge a 12 volt battery. These come in a wide range of sizes. You charge your 12 volt battery and then you can run a wide range of devices off of the 12 volt battery. Below are examples of a charger and battery combination that can be used. Many devices can run directly from 12 volt. If the appliance you are trying to run requires high power AC you can run an inverter off of the 12 volt battery. Inverters come in many sizes. You could also use multiple power boxes at the same time in parallel to charge a battery faster. Selecting a battery and inverter to use with your power box to run an appliance. There is theoretically no appliance that cannot be run off of the power box but you must select the correct battery and inverter. You also need to consider the practicality of how much pedaling you are willing to do for how much appliance usage. To determine what inverter and battery to use, you first need to determine the starting power and sustained power required by your appliance. The inverter must have the instantaneous power and continuous power capability to run the inverter. As an example the inverter shown above is a fairly large one and has the ability to run 1100 watts continuous and double that instantaneous. The 12 volt battery must also have the capability to support the instantaneous and continuous power requirements of the inverter. The 12 volt charger to charge the battery need only meet the power box needs, which is a switching charger less than 20 watts like the example given. As an example, if you wish to run an appliance you first need the power requirements. You should keep your battery charged from a wall outlet. In the case of a long power outage, when running from the battery, you can provide a extra power by pedaling to keep you going a little longer. The power box will provide a maximum of 20 watt hour for each hour of pedaling. You can see from the chart what appliance is practical to keep running. K-TOR• Quality - K-TOR• products are manufactured with high quality, durable materials. They are designed to operate efficiently and last for years. Service & Support - K-TOR• is committed to providing excellent customer service in a timely manner. Service and support, like our manufacturing is based in the U.S. Responses to customer inquiries are made quickly and, often, by the founder Ken Torino•himself.